The prefecture of Rethymno may be the smallest island’s region, but it doesn’t lack in natural beauty, cultural goods and history. It is located in the central part of Crete. Cretan Sea is its north coast and its south borders are washed by the waters of the Libyan Sea. 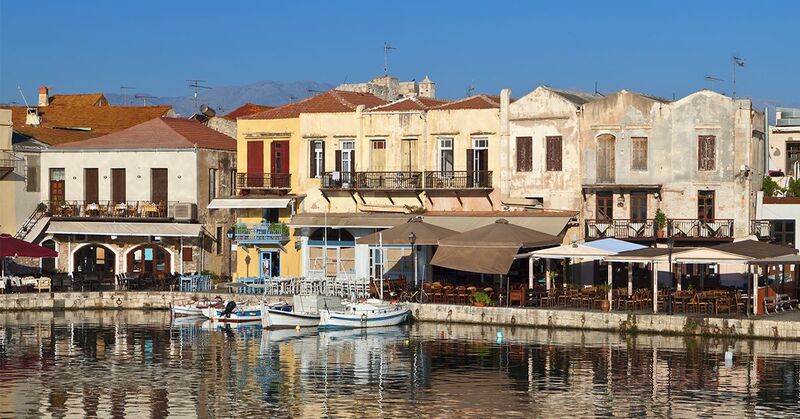 Rethymno is the great and historic capital of the county and one of the best preserved Renaissance city in Greece. With villages of an endless beauty, the prefecture of Rethymno combines all the different styles of landscapes, from mountainous and wild at the highest peak of Psiloritis to heavenly beautiful seaside of Agia Galini. The traveler will find here historic villages (Zoniana, Axos, and Eleftherna), seaside resorts and quiet fishing villages (Bali, Panormo). Some of the villages are located near Minoan-time ruins (Stauromenos), but all of them depend on the rich nature, which was lavished on this blessed place. All the villages of Rethymno prefecture reflect the local culture, keeping the original Cretan character intact, not changed by the continuous development. The traditional culture survives here. From the house of Xilouris, in Anogeia, to the old Byzantine settlements in the province of Amari, where Venetian buildings made of stone harmonically blend with humble farmhouses, surrounded by small Byzantine churches and villages like Spili and Argyroupoli, which are famous for their abundant waters. Most settlements still retain architectural elements from the Byzantine, the Venetian and the Ottoman period. The young people are still living here, though one could think they would have left, carrying on the lifestyle of elders maintaining it as a sacred legacy. The visitor feels the aura of people who lived here and of those who are still entrenched in their traditional tranquil wisdom. The prefecture of Rethymno has a wide number of churches and monasteries, such as the historic monastery of Arkadi, the monastery of Attali or the Timios Stauros (Holy Cross) on the highest point of the whole island. This county, apart from being the smallest, is also considered the Crete’s least explored in contrast with the rich towns of Chania, Heraklion and villages that surround them. Nevertheless, it is one of the most beautiful with the Nida plateau and the Amari valley definitely being one of the best kept secrets of the county, along with magical and exotic beaches of Schinaria and Gyalopotamos. Creating fissures in the earth, which in their turn create vast gorges, such as the Kourtaliotis gorge the Margaritsano gorge, and magnificent caves like the Sfentoni cave or Ideon Andron, the prefecture of Rethymno is embellished with emerald beaches ending up in the Libyan sea. Triopetra, Lake Preveli and Plakias are the most known south coast beaches, while the jewels of the north coast, just outside the city of Rethymno, are the Episkopi beach, Petres or beach of Fortezza. The long kilometers that the visitor may have to walk through the countryside cannot deter him from this journey. On the contrary, it is the ultimate lure to know one of the most traditional and yet popular with tourists prefectures of the country.